As tungsten carbide rings become more popular for men and women, but why buy a tungsten ring? Tungsten carbide is a forged metal with qualities that will last a lifetime. Even though tungsten carbide ring is truly the most rugged and durable jewelry on the market, it can be molded, engraved, set or enhanced to your personal desire. Tungsten carbide is a hard alloy with a high melting point. There is a figure show that its hardness almost reached 89-95HRA, and stays the normal condition under the high pressure and temperature fossilplant over 500℃ while there still remains quite hardness in 1000℃. Therefore, tungsten carbide series products have excellent performance as strong, hypoallergenic, scratch-resistant and long-lasting. In past years, tungsten carbide mostly has been used in rock drilling tool, digging and drilling exploration in the mining field, and some other mechanical industries. With the demands of market, tungsten carbide was taken by jewelry world as a new metal. Tungsten carbide watch was the first tungsten carbide product launching into market with the nature of scratch resistance, tarnish proof. And the further, tungsten rings has been officially stepping into fashion jewelry and women's and men's wedding bands market, which depends on its powerful strength, fine workmanship and beautiful looks. 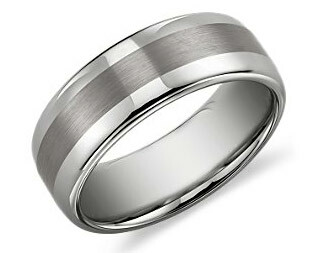 Visit tungsten wedding bands. As tungsten rings become more popular for men and women, so every day, more and more people want something truly unique to match their individualistic spirit. people have begun to wonder, "can I build a unique tungsten carbide ring just for me?" And at Tungsten Republic, we support any custom made tungsten rings and do our best to provide this to our customers. The benefits of the build your own tungsten ring are numerous, but the most important is that special feeling that you or your significant other will get when they open the tungsten carbide ring box and see your creation. Build your own tungsten ring is a great way to symbolize your love and uniqueness. Just keep in mind that any customized tungsten carbide ring can increase the lead time for our manufacturer to create it. It may also, increase the cost as we would not be able to resell or restock a truly unique piece. There is little maintenance problems while buying them. Because it is extremely hardness and durability. Easy to keep the ring staying in the originally charming looks just as the shopping status. Tungsten carbide is the utmost safe material. All our tungsten carbide are cobalt free. You need not have to take your rings off while washing dishes or working on the farm. Take a soft cloth to clean it. Many couples incline not to pay much money on their wedding band. This is one of the reason that tungsten carbide rings has been one of the most populars in the market. Tungsten carbide is not the rare metal as diamond, gold or gemstones, yet our Tungsten Republic tungsten rings presents both stunning looks and incredibly durability at affordable price.